First of all, I'm not a professional builder I'm just your average guy with some talent and a dream. I'm a welder and a machinist in my dad's shop. I'm helping him building machines use in ricefields. 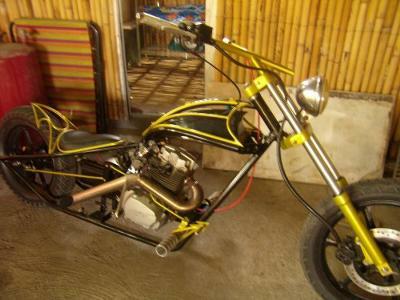 I build choppers back in my garage with the help of my cousin. We use parts from old cars, trucks, junk and other parts that you wouldn't imagine that can be used in a chopper. I also fabricate other parts. This chopper is called "Low boie" (hartford 150). Nice work. I like it. Very innovative using different types of parts. Keep up the good work.